Now that it’s autumn, cold season is just around the corner. 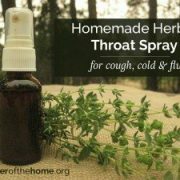 However, having this homemade herbal throat spray on hand can help give relief to sore throats and aid healing. I love having it around! So, first the recipe, then we’ll take a look at why I’ve included the herbs I have. But please note, all of these herbs are optional, so you can switch them out for any others you might prefer, or leave out certain ones altogether. For example, other great herbs to include would be licorice root, sage, thyme, lemon balm, or propolis. This is very flexible! Also, this is a great time of year to dry your own herbs, so feel free to use whatever you have on hand. Place all herbs and spices in a quart-sized canning jar, then pour over the boiling water, pressing down on the herbs to make sure they're well soaked. Pour over the alcohol and cover tightly. Let sit in a cool, dark place for at least two weeks, shaking gently every once in a while if you think of it, and for up to six months. The longer you let it sit the stronger and more potent the tincture will be. 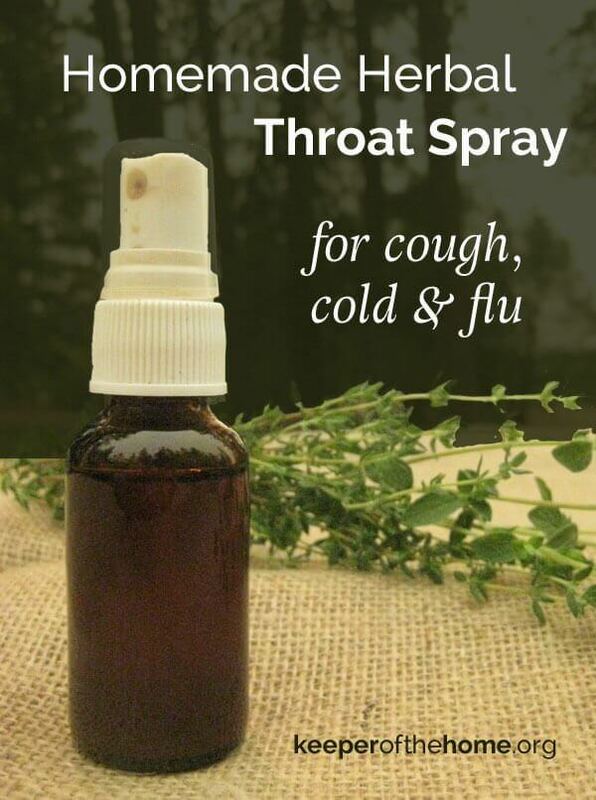 To use, adults use 4-5 sprays every 2-3 hours as needed. 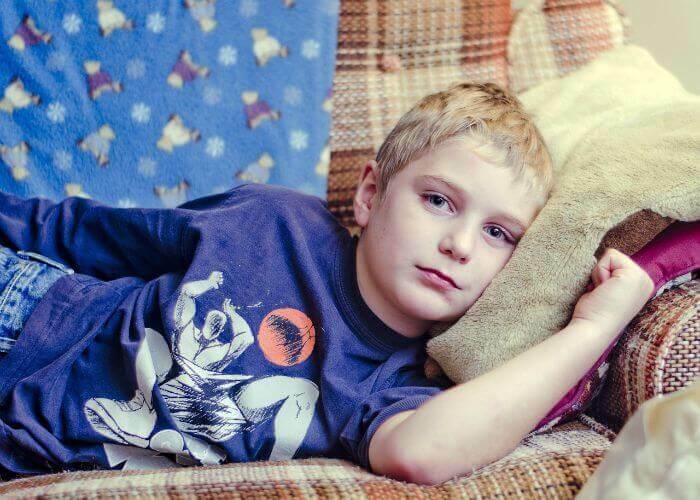 Young children use 1 spray every 2-3 hours as needed and older children use 2 sprays every 2-3 hours. Native Americans have used various parts of the elderberry tree to treat fevers and joint pain for hundreds of years, but elderberry’s real claim to fame is as a cure for the flu. According to USDA Natural Resources Conservation Service, elder flowers can be used to “break dry fevers and stimulate perspiration, aid headache, indigestion, twitching eyes, dropsy, rheumatism, appendix inflammation, bladder or kidney infections, colds, and (treat) influenza,” which is wonderful news for those of us who want natural ways to prevent the flu. I prefer using dried elderberries because elderberries provide a lovely, sweet flavor, but elder flowers provide excellent medicinal benefits as well. Echinacea is an mild but effective immunostimulant that has been shown to increase the production of white blood cells, which in turn fight infection. Echinacea is effective not only for colds and flu, but its stimulant effects “effectively eradicate a number of infectious organisms,” according to Mark Pederson, herbal research chemist and author of Nutritional Herbology. The mint in this recipe is largely for flavor, but various mints are also known for providing relief for itchy throats, so you can choose any mint you’d like. Marshmallow root is a mucilagenous herb that is often used to relieve pain and inflammation in the respiratory tract, as well as treating dry cough. Oregano has strong anti-bacterial properties, as well as provides strong immune support and has proven helpful in treating upper respiratory infections. Horehound is in the mint family, but has a distinctively bitter taste. Its role here is as an expectorant and mild pain reliever. It too is known for its potent antiviral properties. However, it should not be used by pregnant women, as it may stimulate uterine activity. Hyssop is also part of the mint family and is used in herbal medicine to excrete excesses of fluids or mucus and as a vasodilator, thus assisting with breathing problems, such as asthma. Thus, I’ve included it in this recipe as an excellent expectorant and to help relax the laryngeal muscles if coughing has been excessive. It is an especially potent herb and is not recommended while pregnant or by anyone prone to seizure. Ginger is a natural antihistamine and anti-inflammatory, as well as anti-nausea agent. It is likewise warming and stimulating to the nervous system and is helpful in relieving chest congestion. I prefer using fresh ginger because it’s more potent, but ground ginger is certainly a worthy substitute. Also unless you strain it well, the ground ginger can clog the spray nozzle. Garlic is known for its anti-viral properties and stimulates the immune system. Cayenne pepper has capsaicin, which acts as a pain reliever. Even though it’s also what makes hot peppers spicy, capsaicin interrupts the pain message between the nerves and the brain, thus alleviating the pain sensation, especially if you’ve been coughing for an extended period of time. It is warming and stimulating to the nerves, thus increasing blood flow and promoting healing. Cinnamon is high in cinnamaldehyde, a compound known for its very potent anti-viral and anti-fungal properties. It’s also warming, so like capsaicin, increases blood flow, which can speed healing. Honey is soothing, tasty, and coats the throat. Raw honey is packed with nutrients and enzymes and is a powerful antiviral and antibacterial substance, due to the propolis, which is what the bees themselves use to seal the hive from bacteria and infection. One study published by Stanford University has shown that buckwheat honey is especially effective for cough relief, but its flavor is quite strong. Any raw honey will work in this recipe. Make a glycerin tincture (aka glycerite). This option is a bit thicker than the alcohol-based tincture and I’ve had mixed success using it in a spray bottle, but it can also be easily stirred into a small glass of water or juice to drink. It’s also somewhat sweet, which makes it an ideal way to make the tincture for kiddos, as they’re more readily likely to take it. Let the jar sit in a dark place at room temperature for 4-6 weeks, shaking the jar every day or two. The mixture will be very dark at the end of its steeping time. Strain the entire mixture through cheesecloth, squeezing it to make sure every glorious drop of glycerite is released, then strain again through a fine mesh strainer. Place in a bottle and remember to label and date your concoction. Adult dosage is typically approximately 30-60 drops (1/4 – 1/2 teaspoon), 3 times daily, taken in a 2-3 ounces of water OR 4-5 sprays every 2-3 hours as needed. This version is still effective, just not as potent. Place the herbs in the jar and pour enough boiling water to cover the herbs by about half-an-inch. Cover and let sit for 30-60 minutes and until the herbs are cool enough to handle. Strain the herbs through a cheesecloth into a measuring cup, squeezing them to release all the liquid, then add an equal amount of high-proof alcohol. I have not tried this with glycerin, nor have I found information on whether or not mixing the decoction with glycerin instead of alcohol would work in this application. Label and store the same as the full-proof tincture. For any herbal tincture, you can devise the appropriate dose for your child by using Clark’s Rule. Divide the child’s weight (in pounds) by 150, then give the child that fraction of the adult dose as the appropriate child’s dose. For example, for a 50 pound child give 50/150 (or 1/3) of the adult dose. Therefore, if the adult dose is 30 drops taken 3 times per day, the child’s dose will be 10 drops taken 3 times per day (not 30 drops taken 1 time per day). 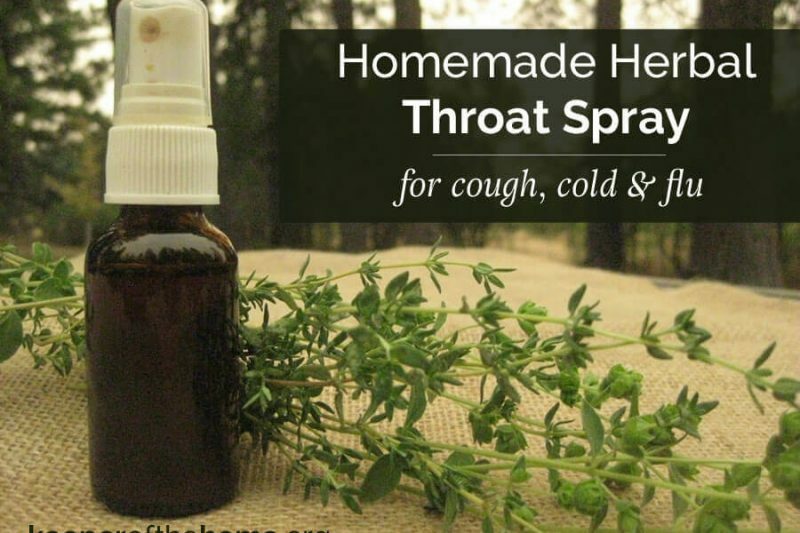 What is your favorite natural way to beat seasonal colds and flu? 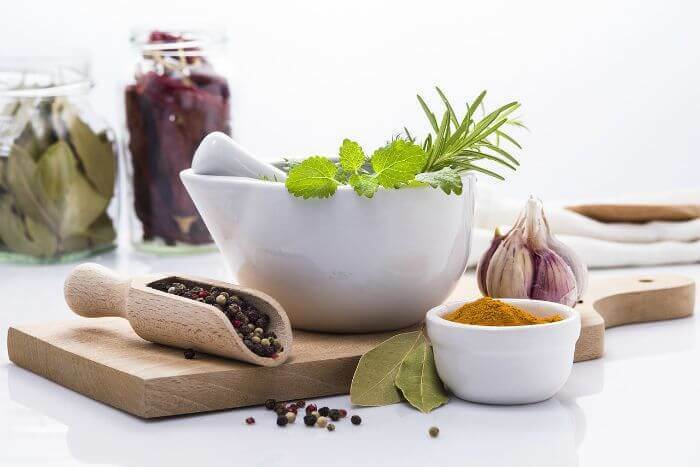 Do you have any favorite herbs?